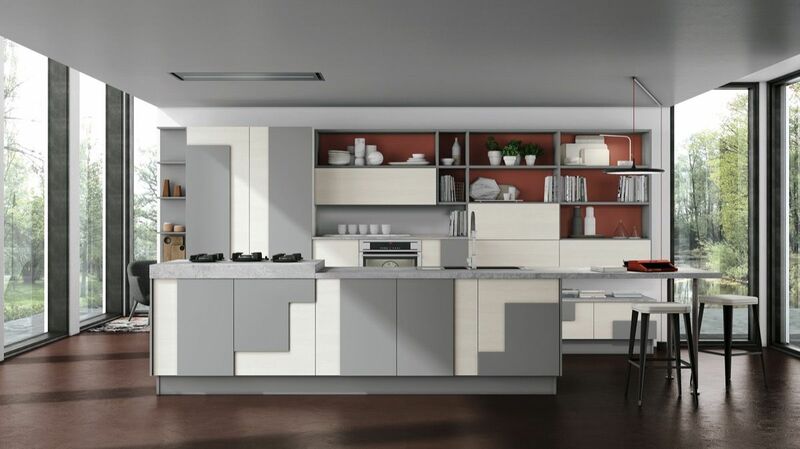 Grey and White Kitchen – Whether your style is contemporary or ultra-modern, grey and white pair together to complete any look. 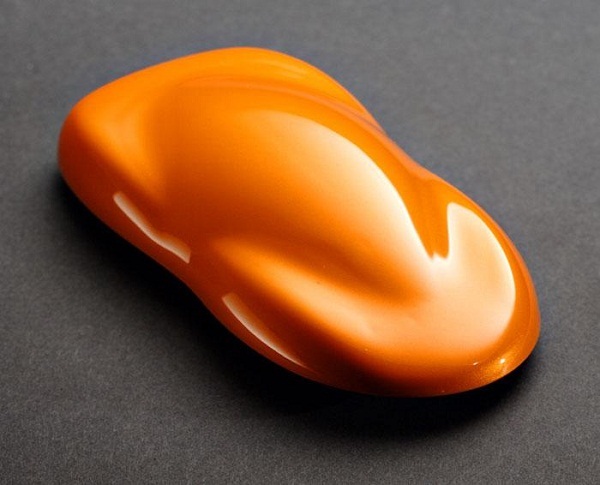 The hues can cover walls, countertops, floors, and cabinets. Using one alone can make a striking statement. Blend the two together for a look of understated sophistication. The two are also combined in these kitchens in marble islands, making a bold statement right in the middle of the kitchen. These 30 grey and white kitchens get it just right. Some intentionally create a cool industrial style and others present in a warm and welcoming fashion. The hardware, textiles, and lighting complete these looks with perfection. The light grey cabinets with no hardware create a seamless look. The low backsplash gave this homeowner a place for accessories, leaving more countertop workspace. 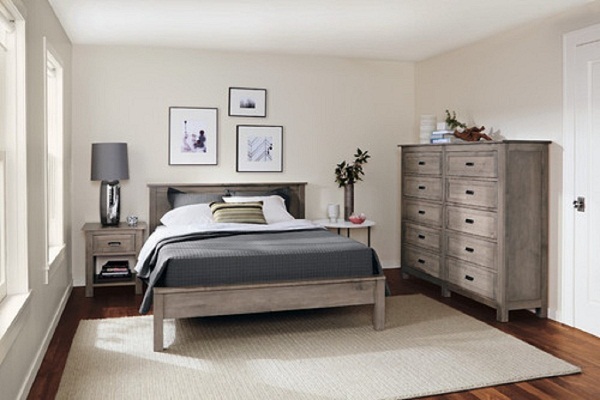 The natural lighting, coupled with the light pine wood floors keeps the look light and airy. 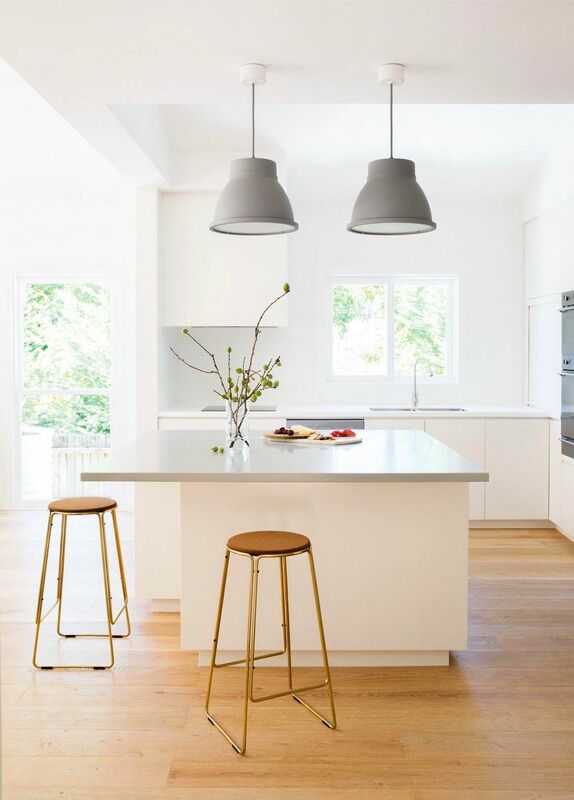 Simple three leg kitchen counter stools, Canned lighting, and white wave pendant lamps complete the look. 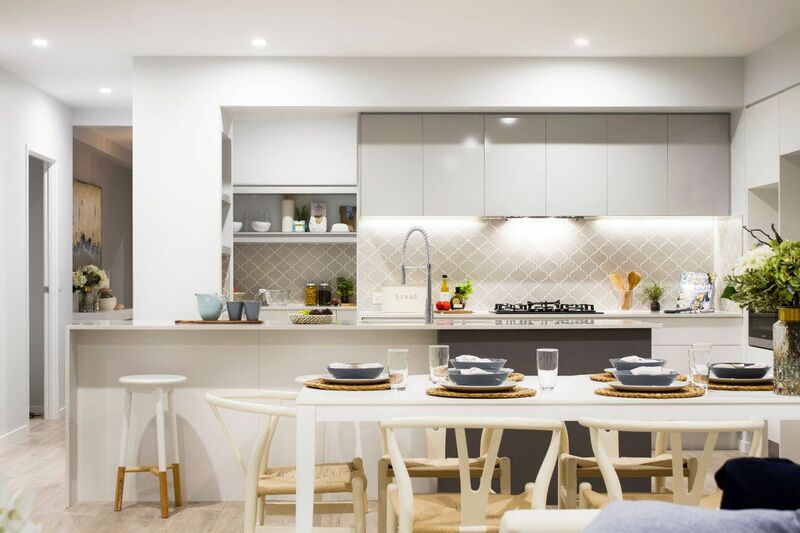 This kitchen blends into the living area and allows ample seating in both rooms with the sectional and large round table with seating for eight in grey. 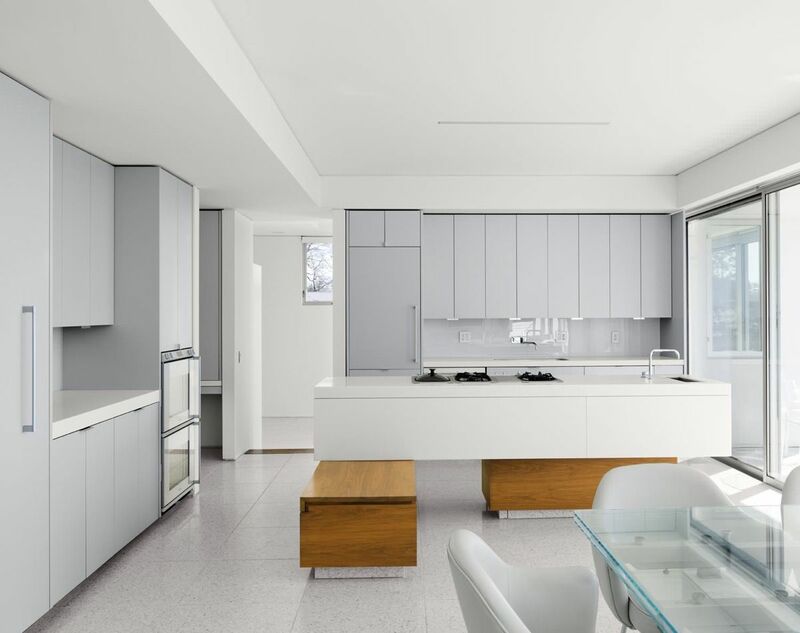 This white modern kitchen uses its space wisely. White cabinets in case the oven and microwave. 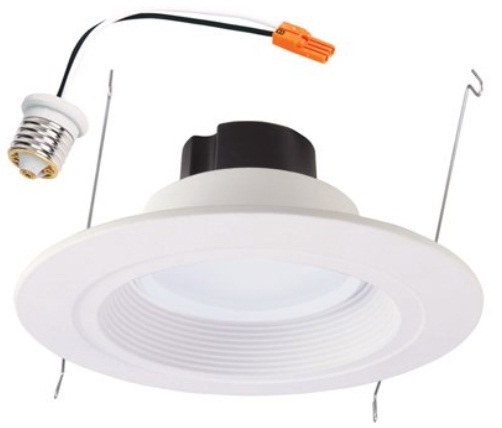 The unusual circle pendant lighting adds a nice touch. This Arizona home has an exterior that fits right in with the desert surrounding it. 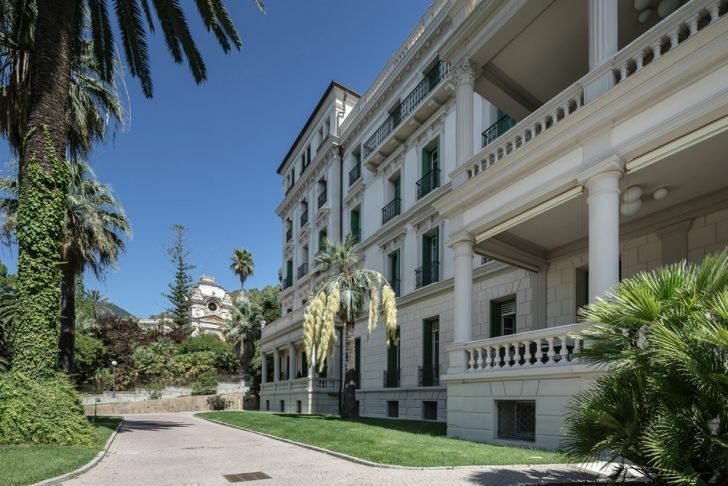 Inside, however, presents modern refinement. 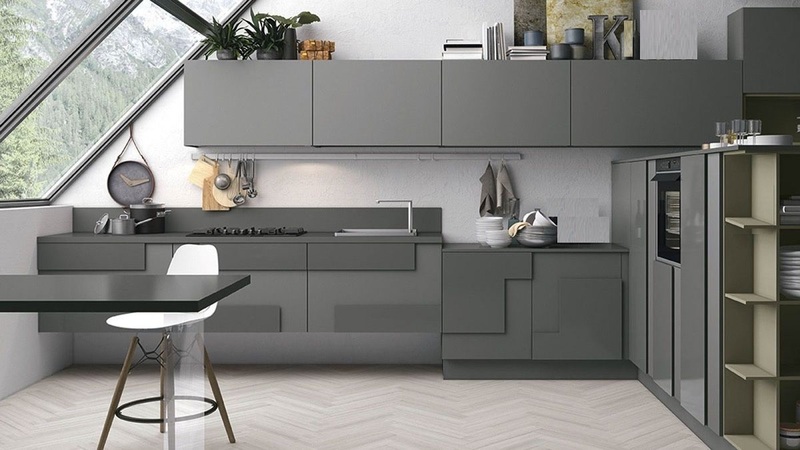 The minimalist look combines slate grey cabinets and island with a chrome finish base. 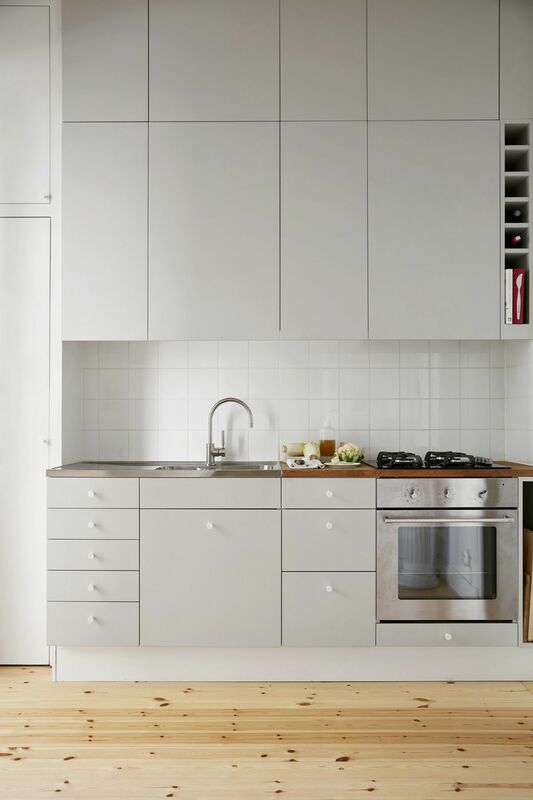 The off-white cabinets provide ample storage space and seem to conceal the refrigerator to the right. The bar in a warm pine finish warms the room. This color block creation mixes hues and textures. Taupe, white, and grey color the cabinets and the amazing built-in surrounding the appliances has a textured appearance. Even the wall has joined the act, with dark grey paint and a grey ringed kitchen clock. 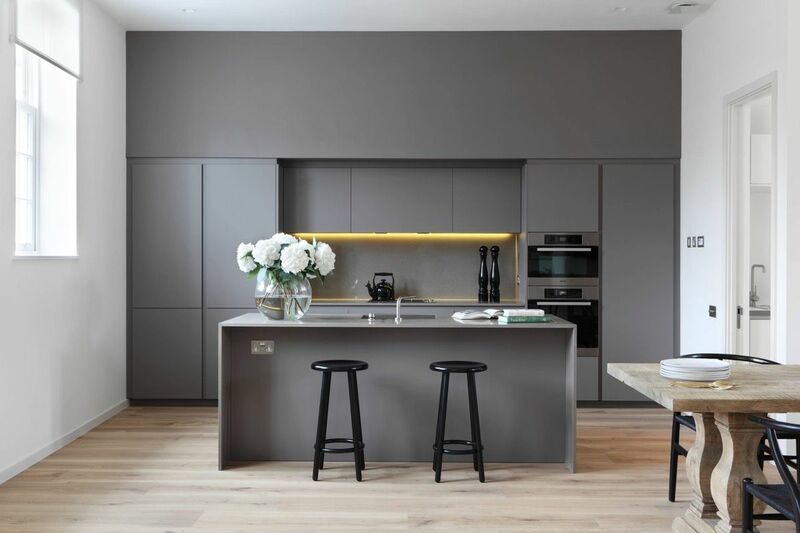 Light grey matte lacquer kitchen cabinets were combined with storage units that open to reveal black shelving for a different look when the pocket doors are open. Sliding glass doors give the room natural light and stand opposite a grey and creme brick wall. The look is completed with a marble backsplash and smoked oak flooring. 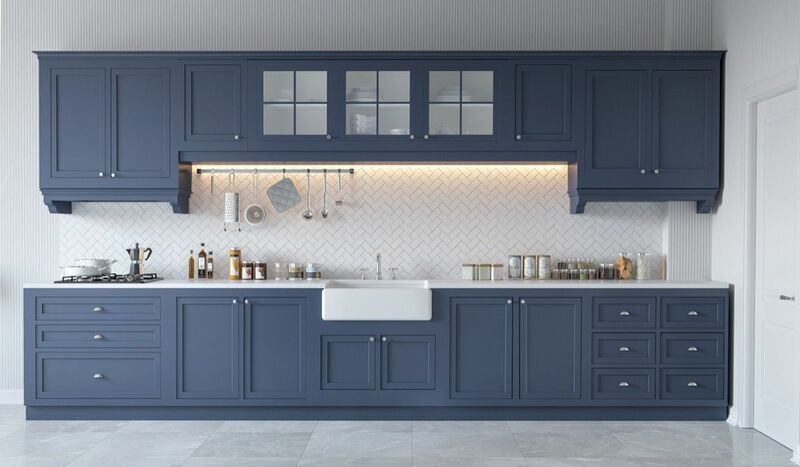 These blue grey kitchen cabinets and white farm sink deliver simplicity and warmth. Window front cabinets are featured on top and can be used to display china. 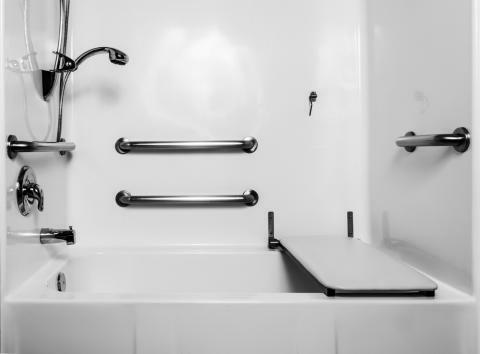 The utility handle on the white tile backsplash offers functionality. The grey tile below picks up the blue in the cabinets. 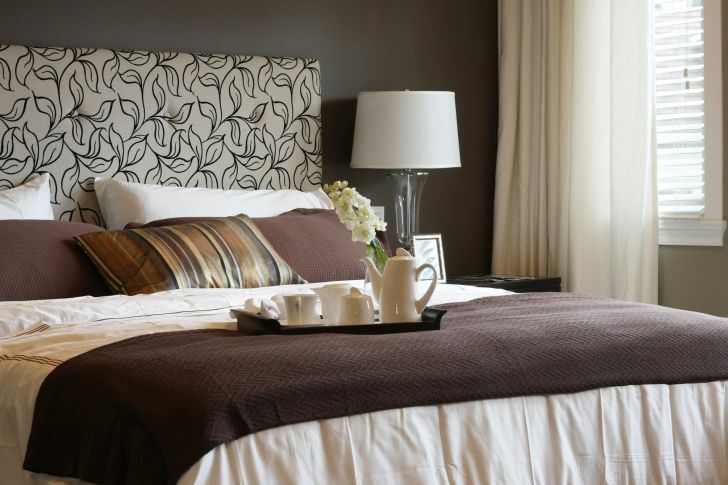 This look differs from the others with an eclectic mix of textiles and styles. the light grey kitchen features a stainless steel refrigerator and dishwasher. 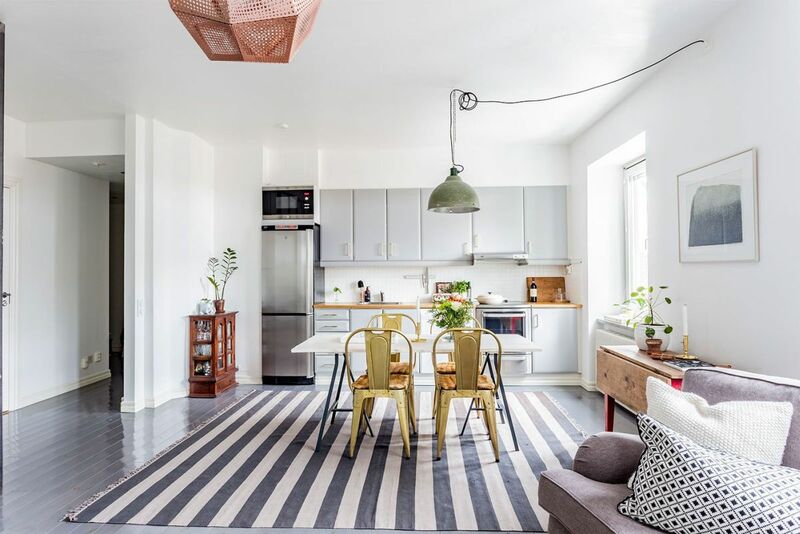 The home makes good use of the combined space and little touches like gold metal chairs and a striped rug over the grey floors give the room character. 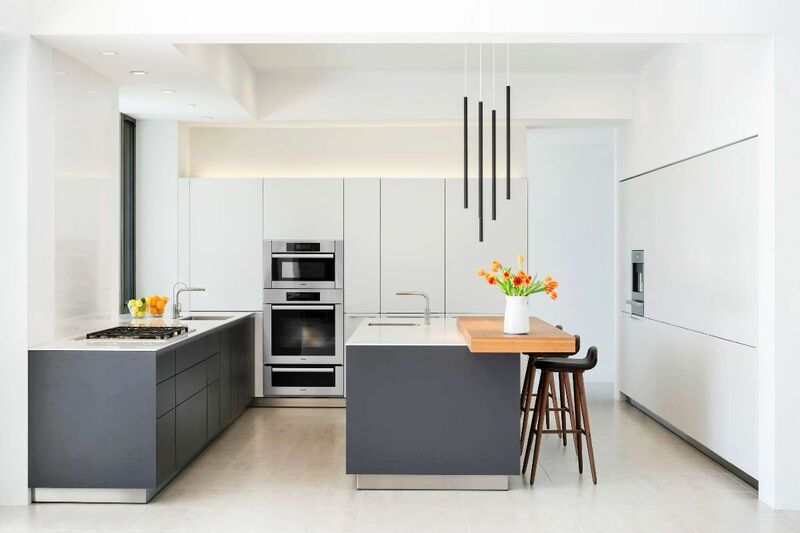 Thie crisp white kitchen sits atop grey floors and uses stainless steel for hardware, appliances, and crystal pendant lighting. 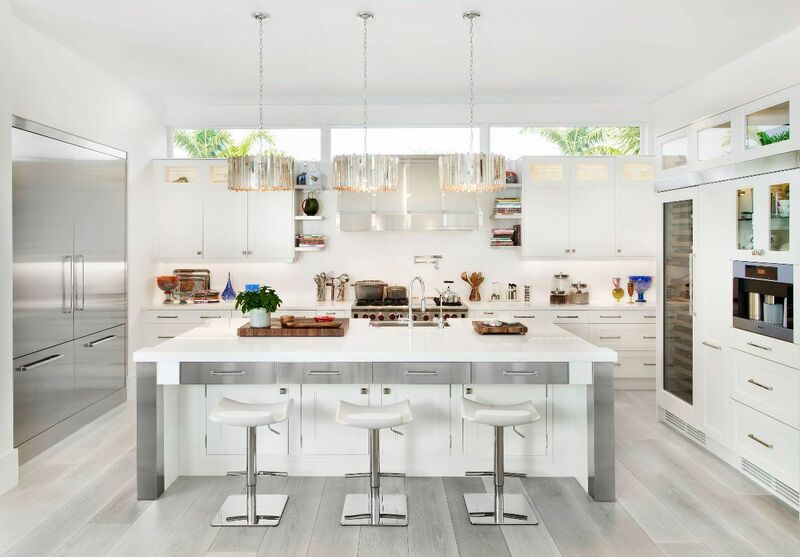 This design uses primarily stainless steel and accents with white cabinets and tile backsplash. Tucked under the bar are round seat contemporary counter stools. Touches of orange were added to the shelves to warm up the look. 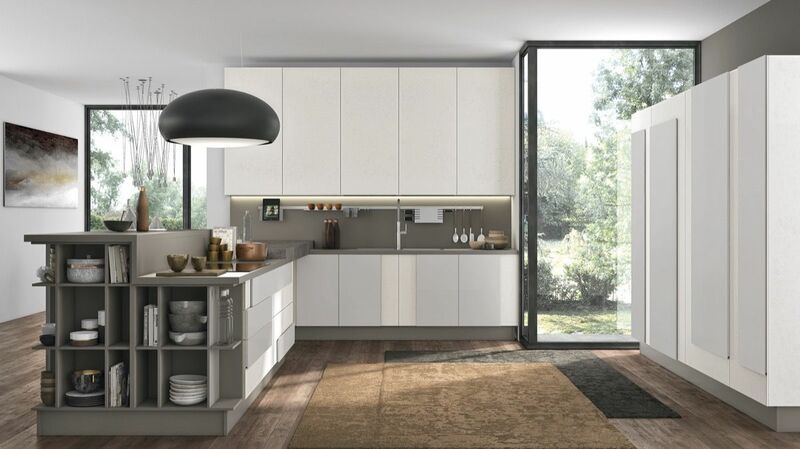 Light gray kitchen cabinets provide ample storage. A white island sits atop maple wood bases and houses the cooktop. The high gloss backdrop carries on the grey look as does the speckled tile. 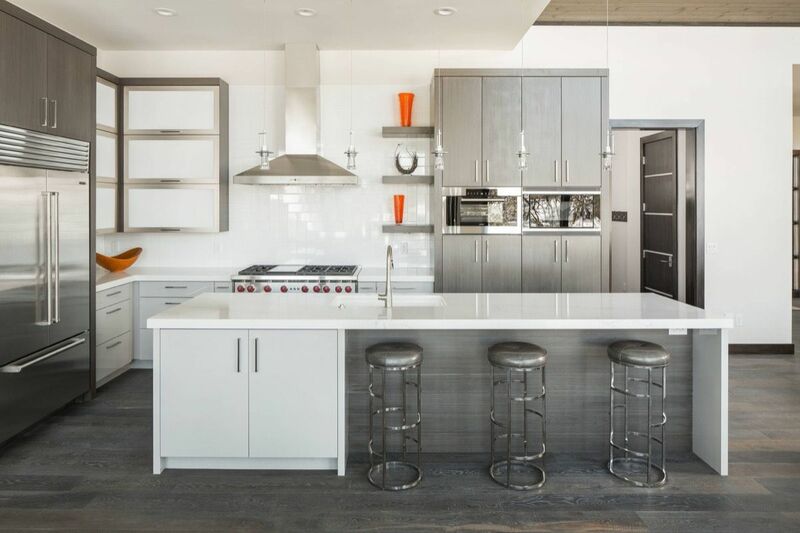 This cool grey kitchen uses the color in te tile floor, wood plank wall, and block cabinets. 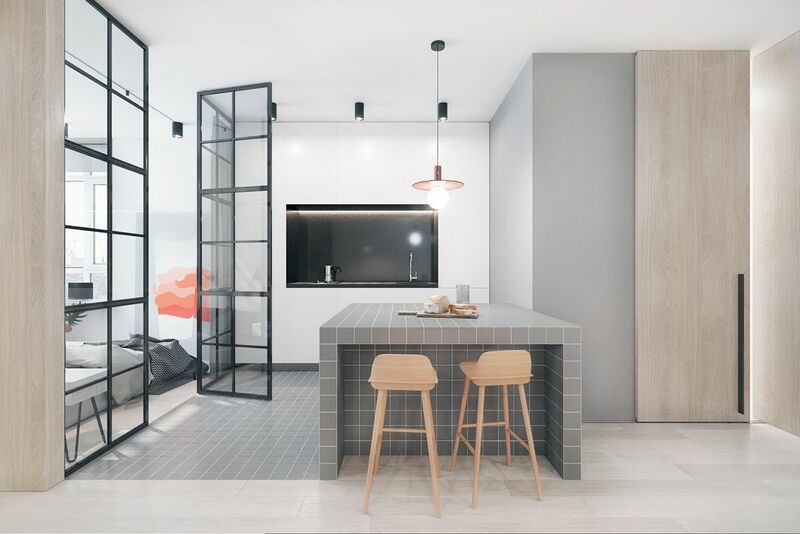 Off-white cabinets with texture are used within the grey. Unusual pendant lightning and yellow chairs add interest in the room. Window coverings in white and grey complete the look. Floor to ceiling windows let the light in and gives a glimpse of nature. The locker style grey and white kitchen cabinets to the right serve as a large pantry. Slate grey counters and island shelves provide a spot for displaying accessories, books, or dishware. 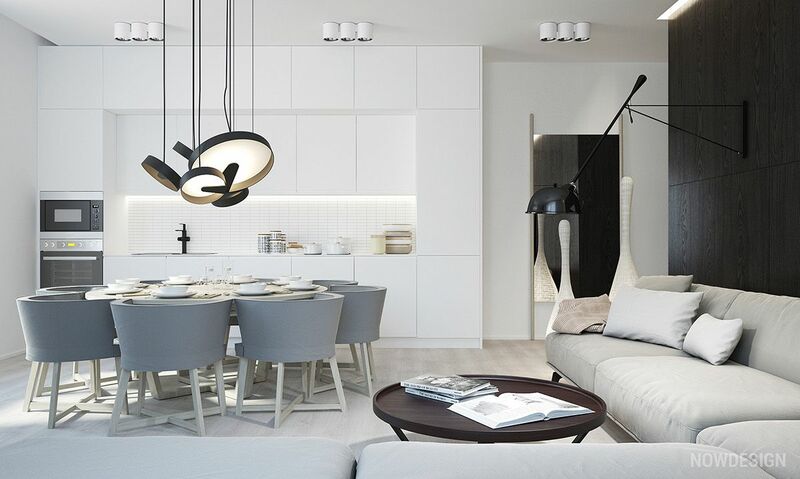 A large black dome pendant light hangs above the island for lighting and a great look. 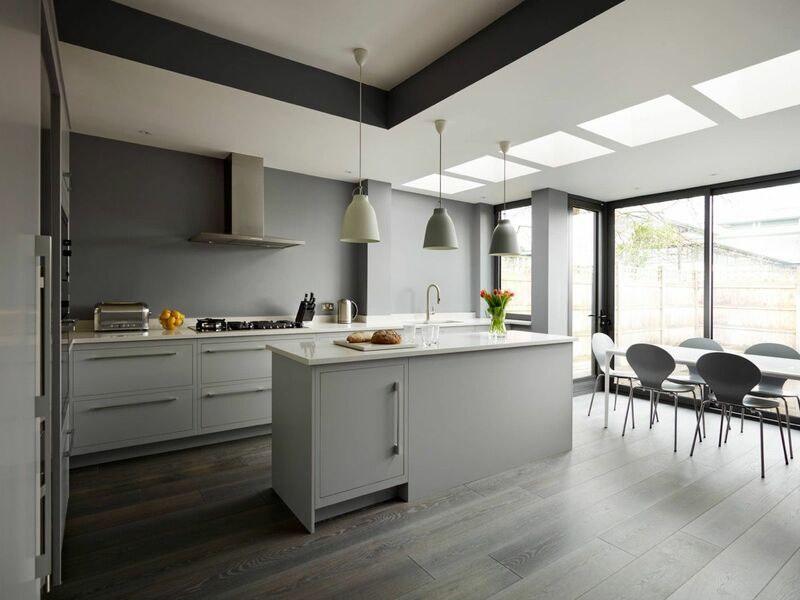 Grey block tiles extend from the floor onto the island in this kitchen. A white wall with black backsplash and counter serve as a backdrop to this white and grey kitchen. 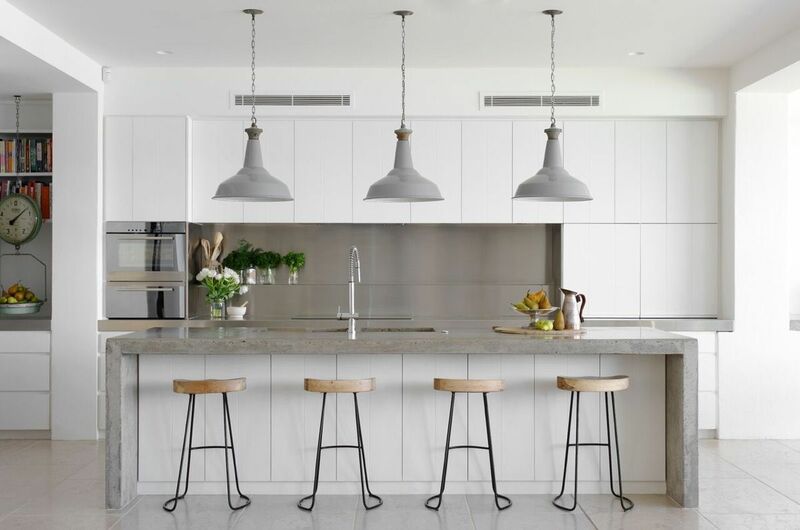 Simple light wood counter stools provide seating. 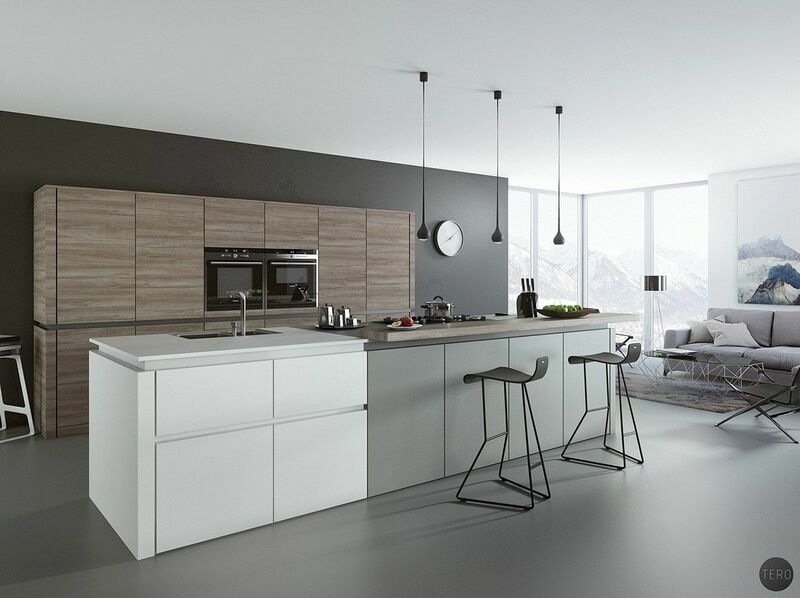 These smooth finish light grey cabinets are topped with both stainless steel and wood block countertops. The knotty pine floor softens this look. Pops of color in this grey and white kitchen design are offered up by fruits and flowers. 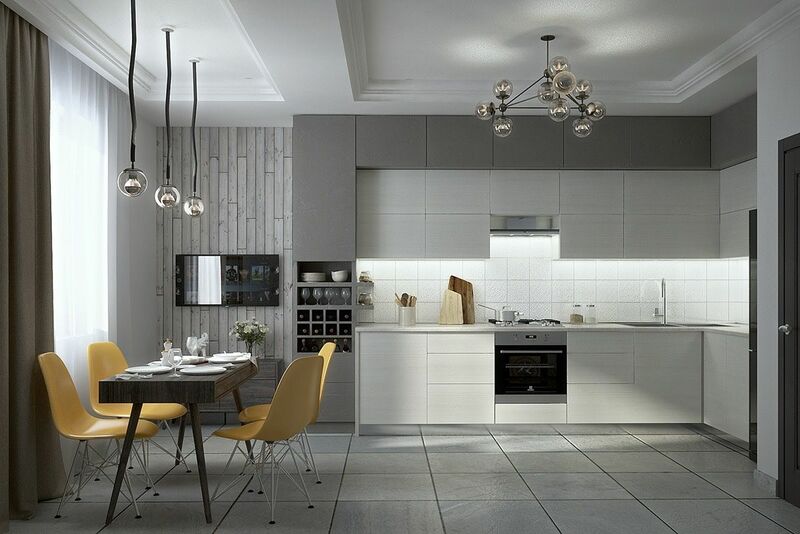 The grey cabinets are coupled with white ceramic countertops and a white and grey brick look backsplash. This kitchen has an industrial look. Slate gray cabinets and countertops work well with the light flooring and diagonal windows. 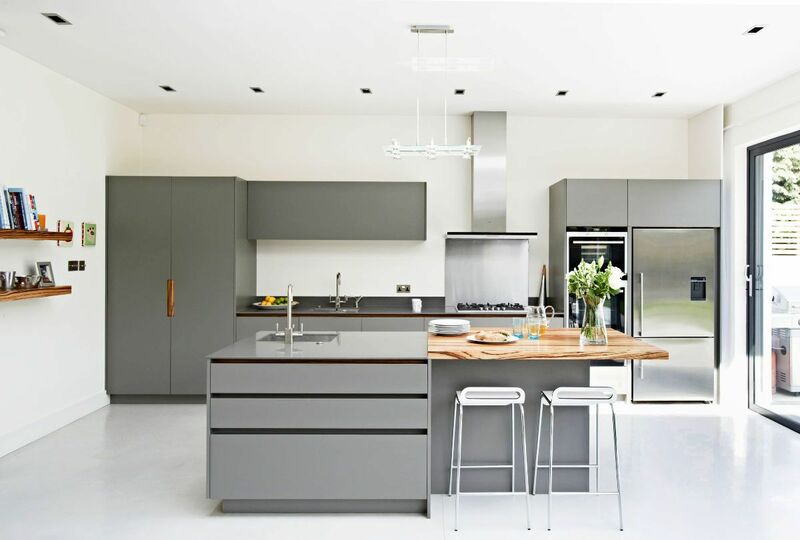 Grey laminate is used for cabinetry and the island in this kitchen. Combined with the light pine floors and pedestal table, the look is less industrial and more modern sleek. This kitchen has a white gloss painted concrete floor. Commercial-type grey cabinets and drawers are used and the island features a butcher block bar. The space above the cabinets can be used for decor. 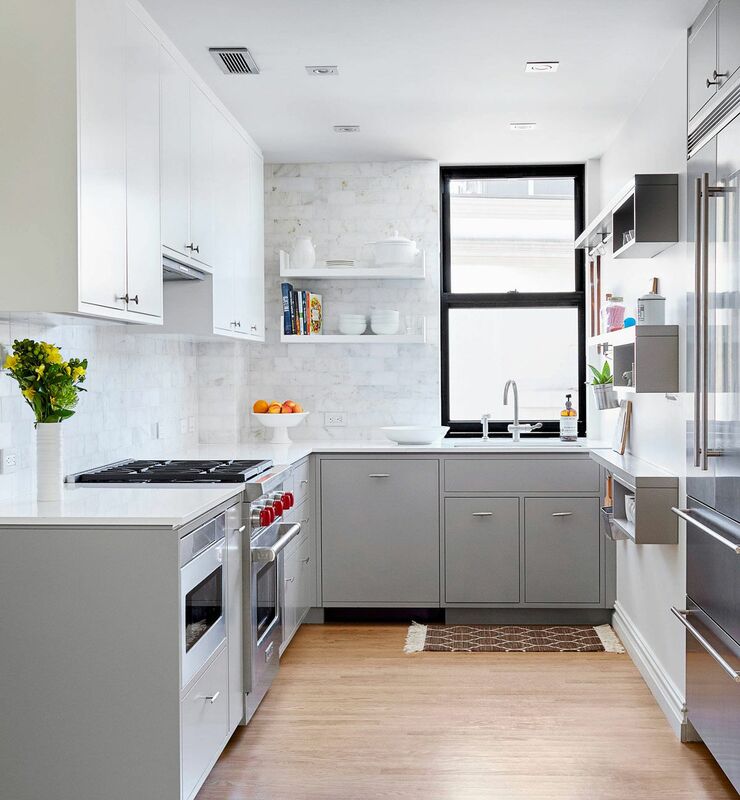 Grey and white come alive in a geometric color block in this kitchen. 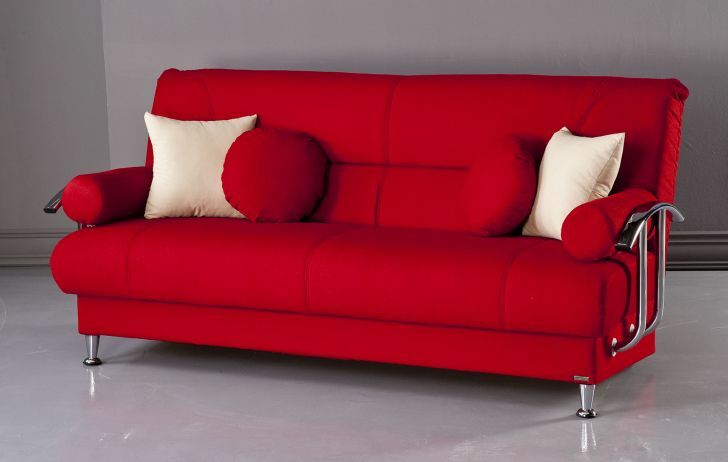 Pops of red are used to color the walls in the shelving. Dark painted concrete complete this look. This semi-industrial look sits in a South London home. It is all at once posh and modern. Touches of wood appear in the cabinet under the island and the warm pine wall apron above the cooktop. White tile, skylights, and sliding glass doors add natural light. 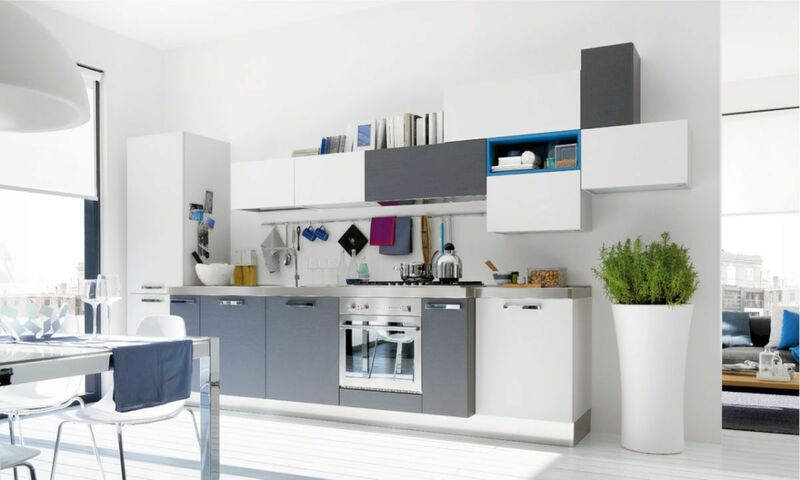 This light and airy white and grey kitchen is accented with touches of blue also seen in the room just beyond. 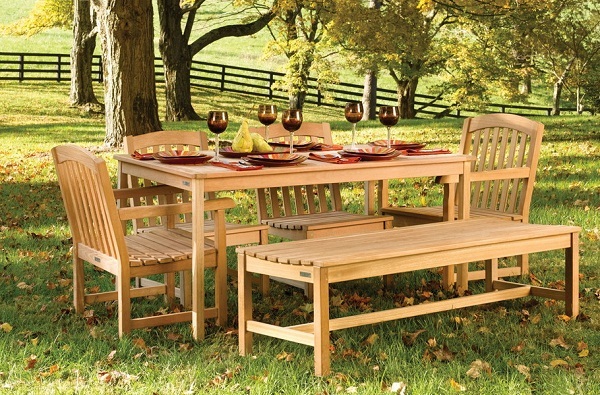 The stainless steel in the hardware extends to the legs of the table and chairs. 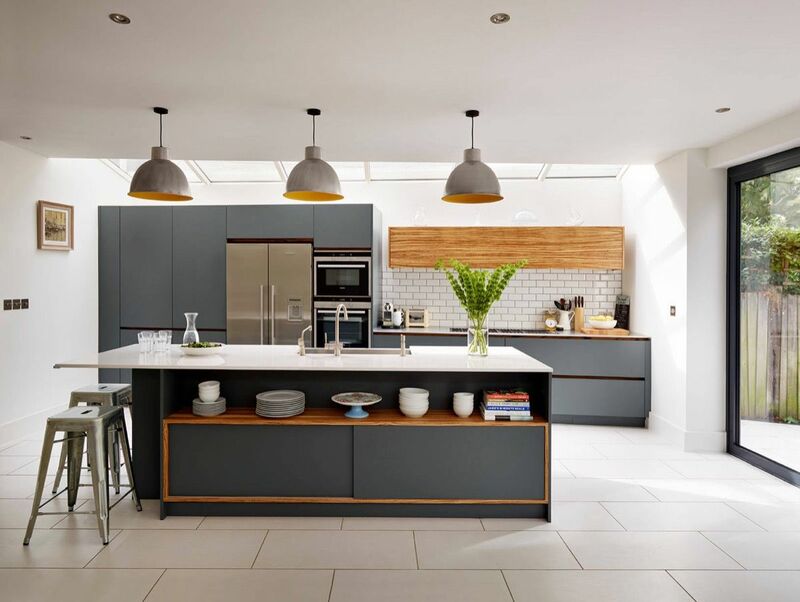 While you expect the normal bit of greenery in the kitchen to come from small individual indoor herb planters, this kitchen eschews that for a dramatically huge one. 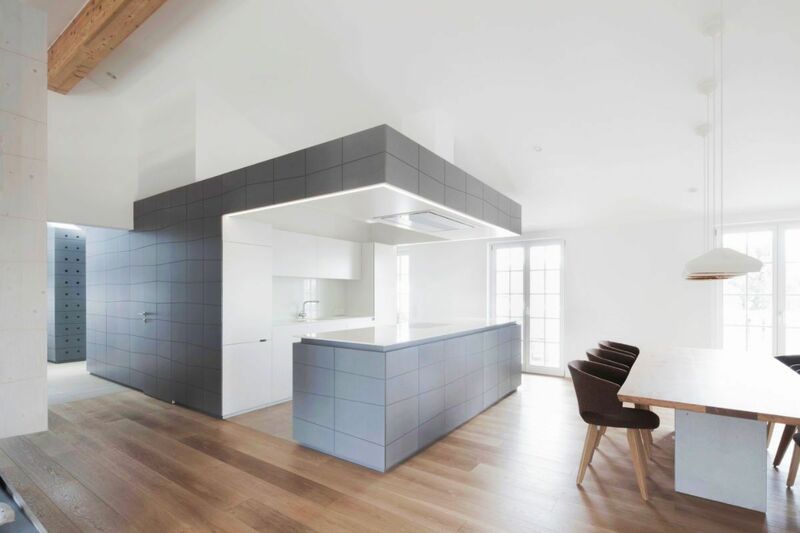 This kitchen is the centerpiece for an Austrian penthouse and features Eternit panels which create the huge slate gray wall that surrounds the kitchen. Above the wall is a floating lightbox. 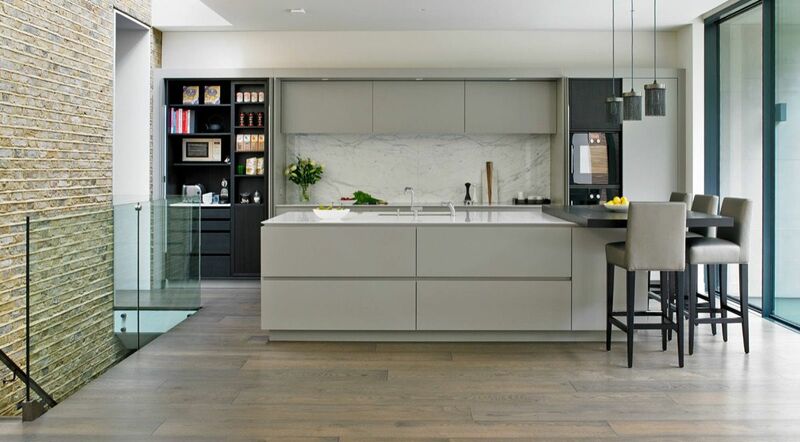 Just inside these sleek grey kitchen cabinets are solid oak drawers made to look modern. This room features skylights that help to keep this design from looking friary. Everything picks up the grey, the wood floors, and walls. The white countertops really help this room to not get too heavy. This kitchen features a marble-topped island, two sinks, and a stainless steel backsplash. The half moon seats on the barstools add a touch of wood in the room. The cool grey tile completes this look effortlessly. 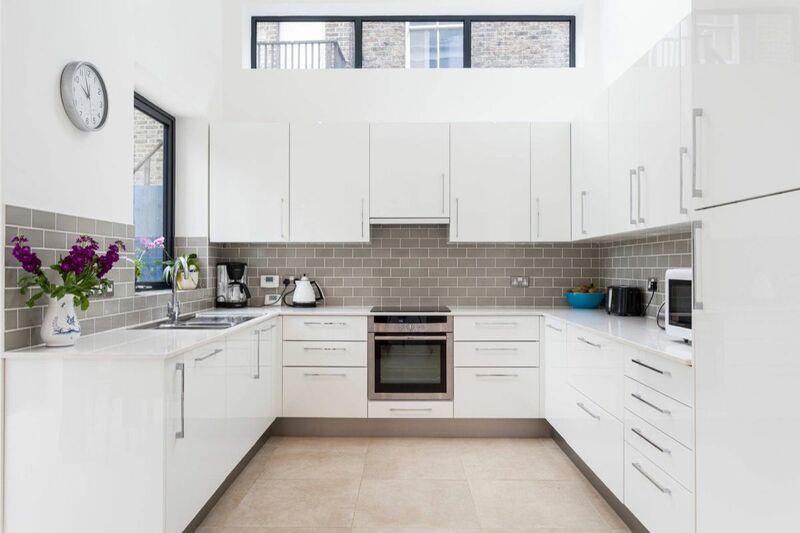 The kitchen of a London home was designed for functionality and provides great lighting through transom windows above the cabinet and casement window over the sink. A brick looks grey tile backsplash accent the white cabinets with pewter hardware. This grey and white kitchen features an island that takes the ceramic countertop down to the floor. Dark slate grey is featured on the base of the island. The backsplash is lattice print in grey and white. It is a simple look atop light pine wood floors. 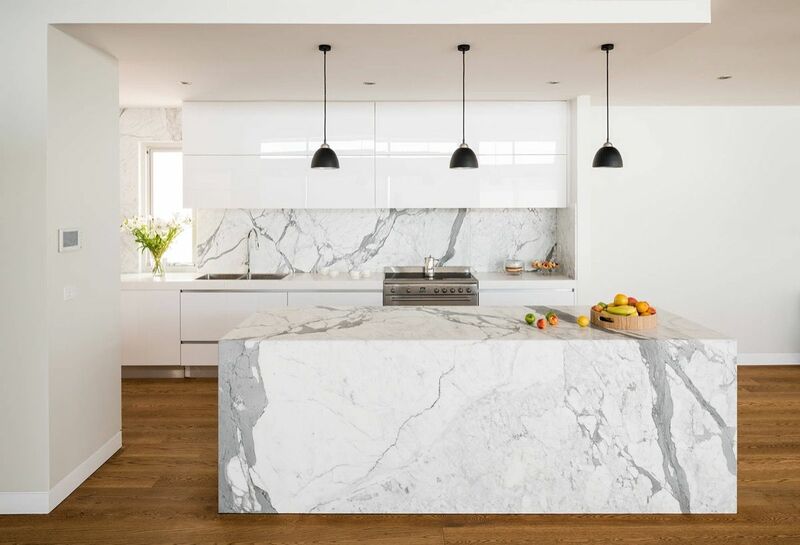 This white simple and sleek kitchen design adds a bold look with its full marble island. The look is picked up in the backsplash and works well with the white cabinets. 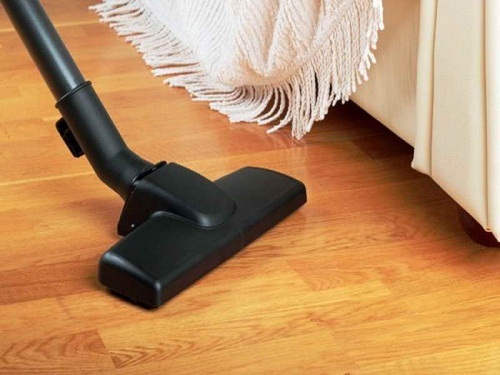 The contrast of the dark wood floors adds interest. Again, a marble island is used as the centerpiece. 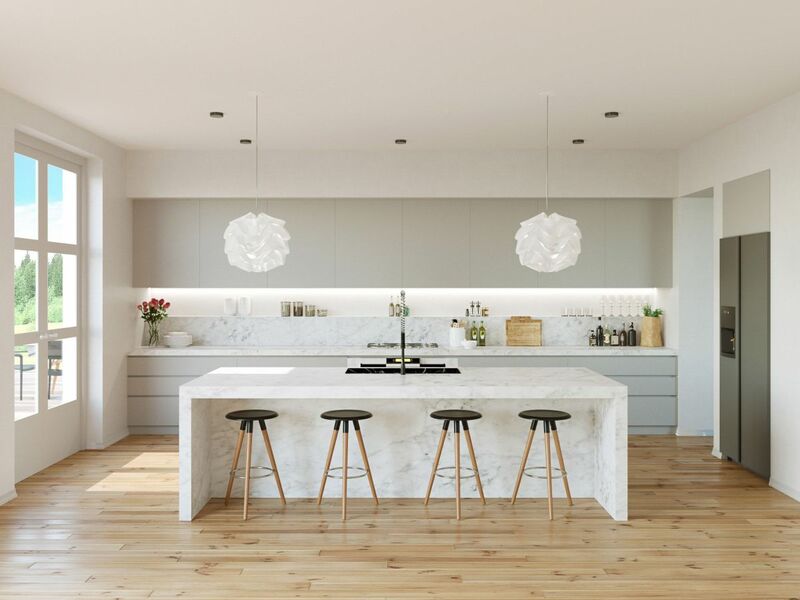 White countertops and cabinets accented with the marble backsplash make this modern design a winner. 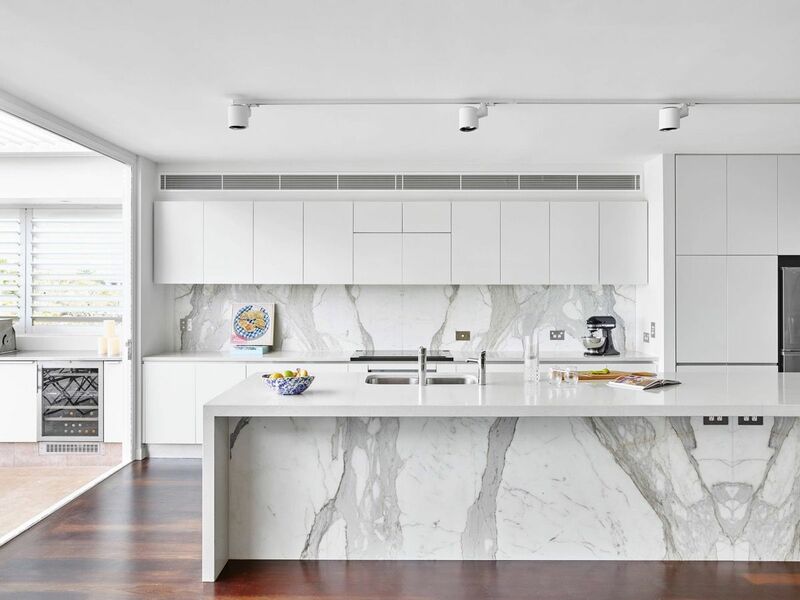 Do check out our post on marble kitchens if you like this kind of look. 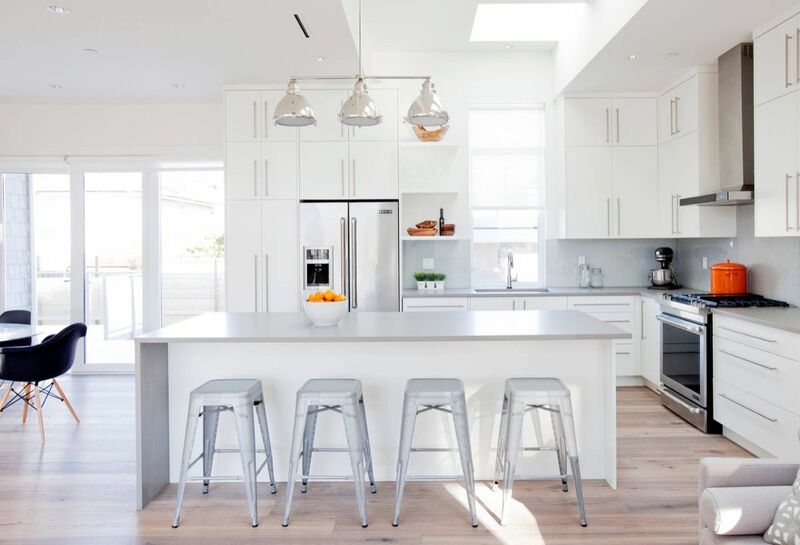 This white kitchen has warm maple floors and a grey countertop on the island. The pendant lamps are from Mutto.